I am not what you might call a 'traditional' autumn decorating kind of girl. I am a little on the softer side of things color wise. a happy all things natural autumn kind of girl. and all with my French Country Cottage style charm? Well, I was just a little bit giddy as I dreamed up a few designs. And first on the list was a wreath. 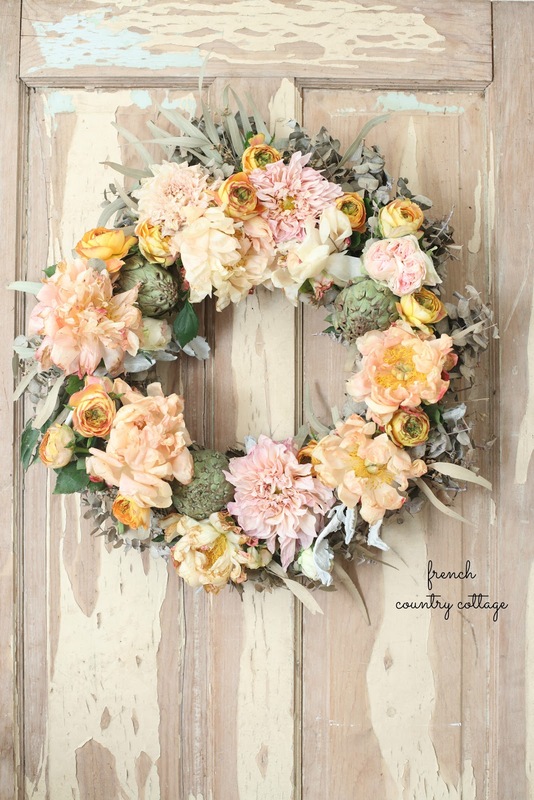 I wasn't sure just what my 'French Style Autumn' wreath would look like. I knew where I was starting. (that matched my shorts) came home with me. to a perfectly peachy colors of autumn just a bit. they inspired the French Autumn Style palette. The next stop was to order other natural bits. I had an idea of what I wanted but as with any flowers any type of year-you have to work with what is seasonal as well. I asked what they had in that was Autumn colors. 'Yep. I know. Let's go with Autumn wedding then maybe? 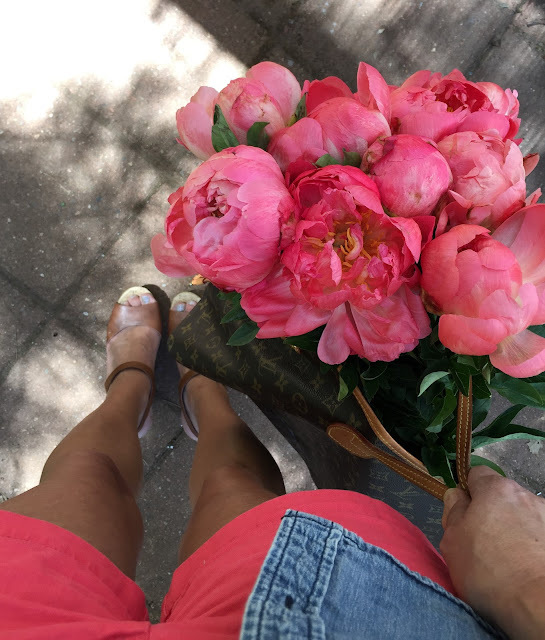 Like Autumn wedding flowers...but in June. 'Welcome to my crazy fun and seasonally confused world. along with pretty sage greens. I could hardly wait to play. Bit by bit the wreath started to take shape. was starting to take shape. and a feature in French Style Magazine. It is definitely not traditional... but I am in love with how it turned out. and how it all came together shortly. or are you more bold and beautiful fall type? i love the muted colors, the greens definitely make it feel festively autumn. Love the wreath - I also am not a traditional autumn decorator. Love the soft colors. Well... I am a LOT on the softer side of things color wise so never use the traditional autumn colors (or bright red and green at Christmas for that matter)LOL!!! So I always love and look forward to all your decorative talents coming to life right in front of my eyes! I especially love how you used artichokes and those dahlias are to die for. Autumn beauty at its best! Love this softer side of Fall. Your wreath, along with the chippy door is pure perfection. Absolutely LOVE it!!! Beautiful and spot on with the soft colors. Thanks for inspiring! I prefer to enjoy the softer side of fall as well, but gosh, this is gorgeous! Love the wreath colors! Coral peonies are so beautiful!! Love the wreath! Very pretty! I"m a soft pink and pastel color gal. 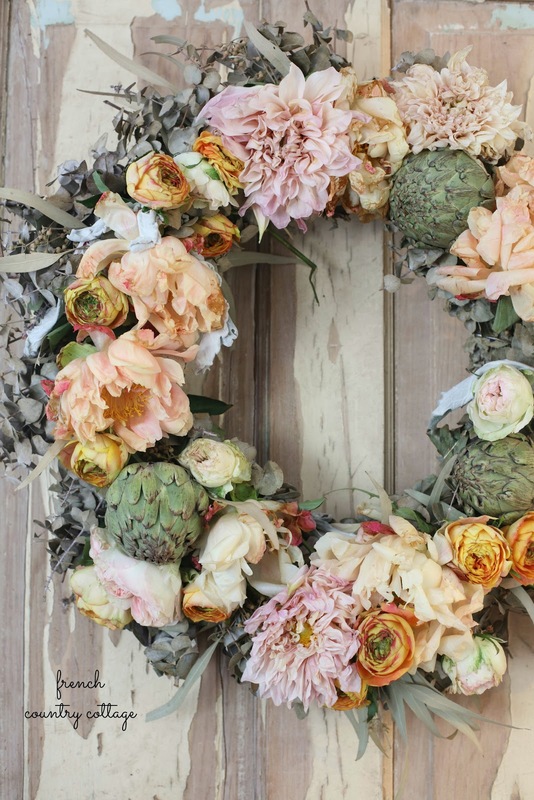 I like wreaths, so mutch. I also create a lot. Oh my goodness!....I just picked up this magazine and placed it on my coffee table this afternoon to read next week when I am recuperating from my hand surgery that I have put off for far to long...I ran to the table opened up the magazine and there you are!... 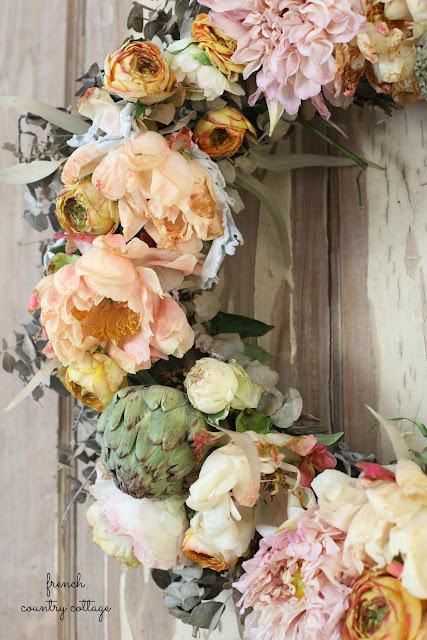 Pages of sheer beauty!...Those flowers just make you smile!...Gorgeous wreath...gorgeous mantel...gorgeous everything!!! 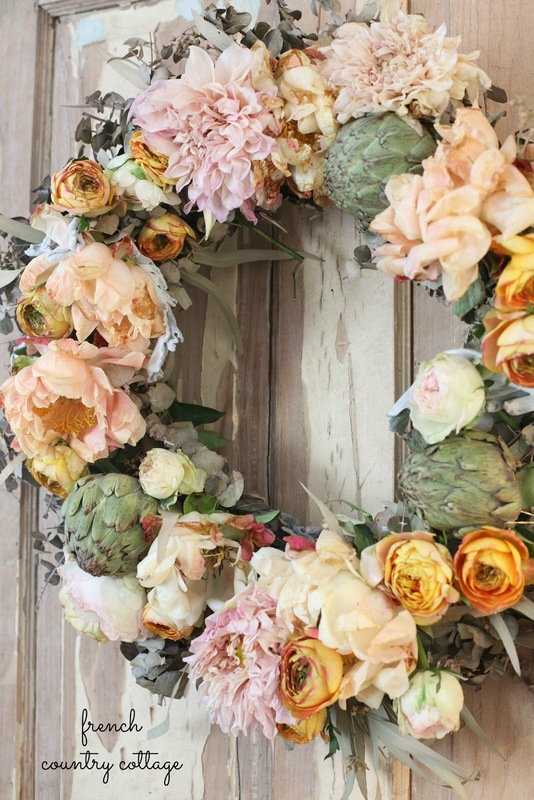 Can a wreath leave you speechless it is so pretty?? ummm yesssss!